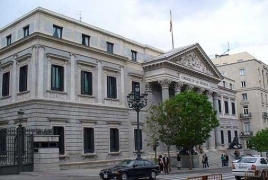 PanARMENIAN.Net - The foreign relations committee of the Congress of Deputies of Spain rejected a motion that asked the Spanish government to recognize the Armenian Genocide. This is the third similar attempt in recent years, Anadolu Agency reports. The proposal had been submitted by the Republican Left of Catalonia (ERC), which, in addition to recognizing the Armenian Genocide, it also urged the Spanish government to initiate talks with Turkey so that Ankara acknowledges the Genocide too. The bill was rejected by a vote of 17-9, with nine abstentions. All but three of the 17 voting against the motion represented the ruling People’s Party. Parliaments of 5 Spanish regions - Aragon, Balearic Islands, Basque Country, Catalonia and Navarre - as well as some 30 Spanish cities within 7 regions have so far recognized the Armenian Genocide. Some three dozen countries, hundreds of local government bodies and international organizations have so far recognized the killings of 1.5 million Armenians in the Ottoman Empire as Genocide. Turkey denies to this day.